2014 saw a full half year of chemical infusions. I had chemotherapy from July until November, then a stem cell transplant with day zero being 11-12-14. I am finally regrowing my hair. The eyebrows are returning, goatee is intact. Scruffy facial image in progress. I’m quite pleased this is happening too! I looked in the mirror not too long ago and noticed a resemblance. 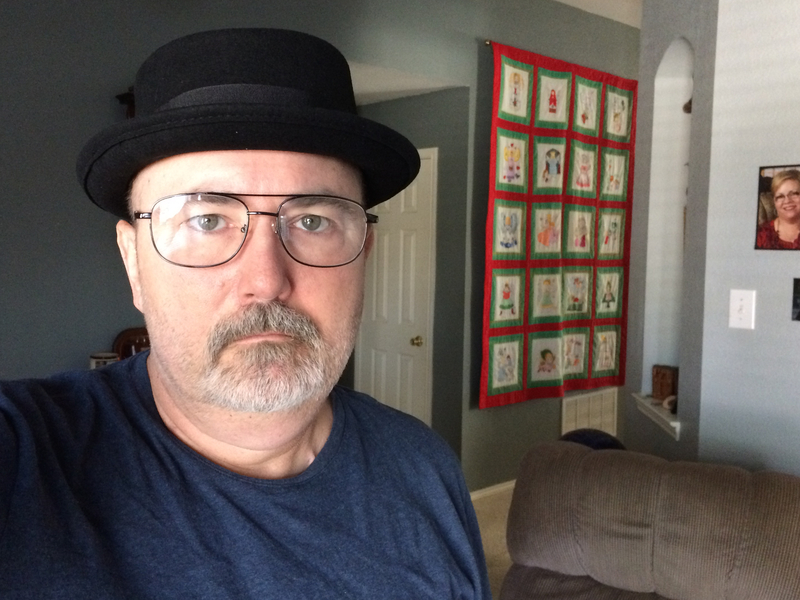 For those of you who have watched Breaking Bad or at least seen the images from the last season or so, Walter White, a chemist, goes from mild mannered school teacher into building a drug empire. He gets hooked on power and transforms into this character he calls Heisenberg. Hope I spelled that correctly. I noticed a little resemblance. Just the image, I’m building no empire thank goodness, too much work and the cost is too high. I ordered a cheesy pork pie wool hat and had glasses that worked. I wanted to make some kind of Breaking Cancer skit, but I’m just not that creative. For those of you reading on wordpress, I have a full blog site with tons of videos and pics at http://www.kraftsims.com. You can follow the video link. No deception intended, this video is fairly boring. Many have been asking for some kind of update, so this is my attempt at an update. Things are going well, nothing to report, just a slow steady recovery from a stem cell transplant. For this, I am grateful. This entry was posted in bad, breaking, cell, stem, transplant and tagged burkitts, cancer, lymphoma. Bookmark the permalink. lookin good – when we gonna c u in Eve again? I’ve been on a time or two, but not for long. Wow had a major expansion that has been fun. I tried to fly a ship, but had trouble concentrating and you know Eve…no room for mistakes, too costly and requires being alert. Intense game for sure. I’ll have to “start over” (so to speak) on the game again, relearning it.